A key component of the Coney Island Strategic Plan (the “Strategic Plan”) announced by Mayor Michael R. Bloomberg and the Coney Island Development Corporation in 2005, the Project calls for the creation of a new iconic civic and entertainment destination on a 2.2-acre site between Keyspan Stadium and the famous Coney Island Boardwalk. This new mixed-use plaza would contain a variety of uses, including the restored B&B Carousell, a historic 40-horse carousel purchased by the City of New York in August 2005. In conjunction with additional planned improvements to the streetscapes and public open spaces and enhancements of existing facilities and landmarks, Steeplechase Plaza will serve to anchor new private development in Coney Island with dramatic new public amenities. 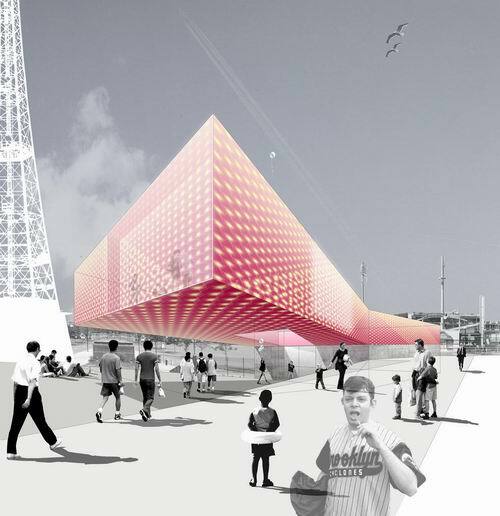 There was a design competition in 2004 for a Parachute Jump Pavilion that resulted in the selection of the design pictured below. It came from London-based architects Kevin Carmody, Andrew Groarke, Chris Hardie, and Lewis Kinneir. The winning design was a 7,800-square-foot, glass-enclosed structure lit up by a dense pattern of light bulbs, a high-ceilinged exhibition space, a restaurant, a bar, and a souvenir shop. We don't know if it will be incorporated in the new "Steeplechase Plaza" design.